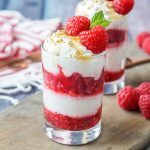 Recipe for Cranachan- a Scottish dessert made with layers of crushed raspberries and whipped cream flavored with Scotch whisky, toasted pinhead oats, and honey. Disclaimer and Disclosure: This recipe contains alcohol. It is intended only for those over the age of 21 (in the United States). Please drink responsibly. This post contains Amazon affiliate links. If you purchase something through the link, I may receive a small commission at no extra charge to you. We are in the middle of our big move from Northern Virginia to Los Angeles and while clearing out the pantry, I needed to make something to use up bits of remaining honey, whisky, and heavy cream. My mind immediately went to the Cranachan recipe I saved from Caroline’s Cooking last year. 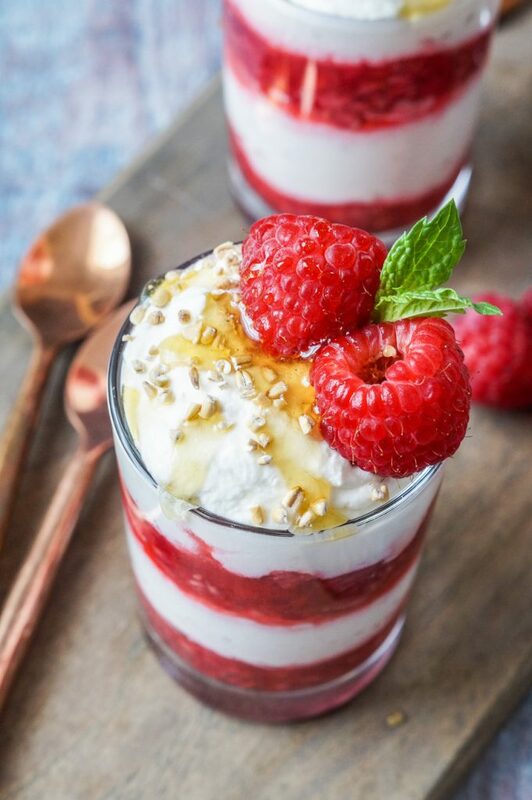 Cranachan is a Scottish dessert made with toasted pinhead oats, whipped cream, crushed raspberries, Scotch whisky, and honey. This dessert comes together fairly easily, though I did come across a handful of ways to prepare it. 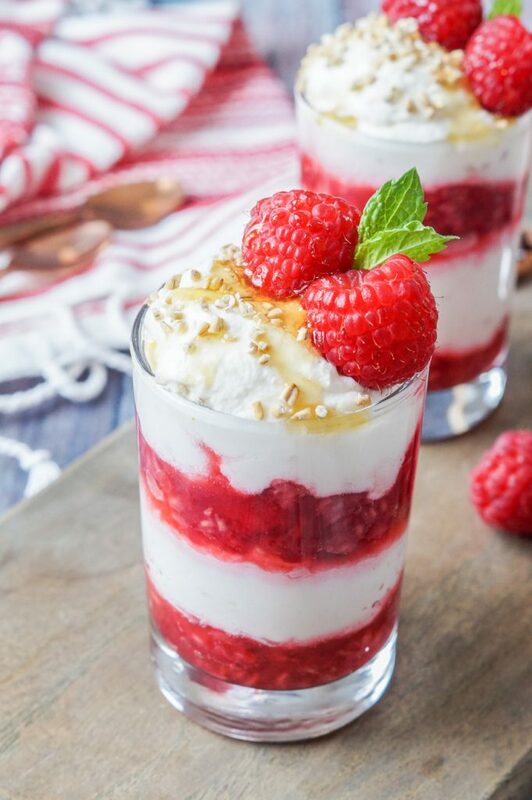 I layered the raspberries and whipped cream for a nicer photo, but you can combine everything together right before serving instead of layering. Crowdie (a soft Scottish fresh cheese) can also be mixed in with the whipped cream. According to Christina’s Cucina, North American raspberries are a bit more sour compared to their Scottish counterparts. To help bring out the flavor, I stirred in a large pinch of sugar to taste in addition to the honey and whisky. Pinhead oats (also called steel-cut, coarse, or Irish) are created by cutting the groat into pieces instead of rolling it flat. They generally take longer to cook than instant or rolled oats, have a chewier texture, and are lower on the glycemic index. They can be found in the oats section of many larger supermarkets and are also available on Amazon: Quaker and Bob’s Red Mill Steel-Cut Oats. Be careful when toasting the oats. They go from toasty and fragrant to burnt quickly. Looking for more Scottish recipes? Try Scottish Morning Rolls, Scottish Shortbread, and Scotch Pancakes. Place a large, dry skillet over medium heat. Add the oats and cook, constantly stirring, just until toasted and fragrant. Remove to a bowl and allow to cool. Place 3 tablespoons of the toasted oats in a small bowl, cover with 2 1/2 tablespoons of the whisky, cover, and allow to soak overnight. Cover the remaining oats and set aside to use for garnish. In a medium bowl, add 3/4 of the raspberries (set a few aside to decorate the top) and gently mash to break up and release some of the juice. If needed, sweeten with granulated sugar, 1/2 tablespoon of the honey, and 1/2 tablespoon of the whisky. Set aside or refrigerated if not using right away. In the bowl of a stand mixer fitted with a whisk attachment or a large bowl with a hand mixer, beat the whipping cream until soft peaks form. Beat in the remaining 1 1/2 tablespoons honey and 1 tablespoon whisky until stiff peaks form. Gently fold in the whisky-soaked oats from the night before. 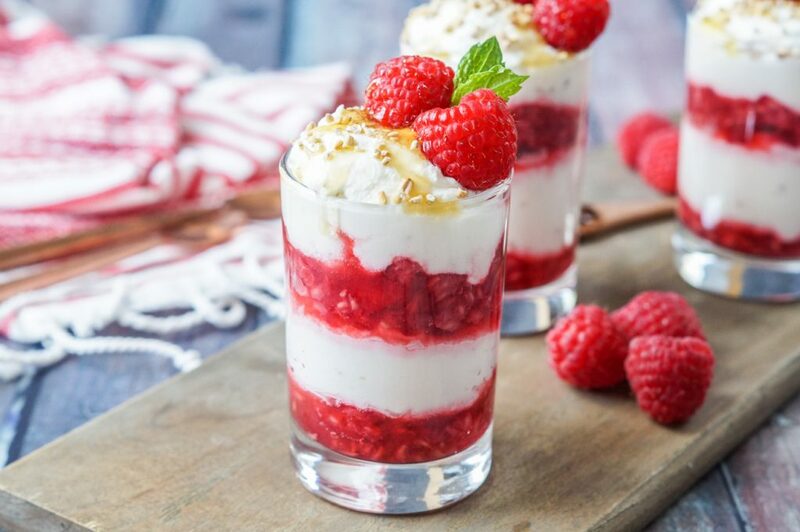 Place a spoonful of the raspberry mixture into the bottom of two serving glasses. Cover with a layer of the cream mixture and a small pinch of the set-aside toasted oats. Repeat with more raspberries followed by more cream, finishing with a layer of cream. Top with the remaining toasted oats and a couple of whole raspberries. Allow to chill, removing from the refrigerator about 20 minutes before serving and top with a final drizzle of additional honey. These are best within a few hours of being prepared.